I also bought two little kid sized chairs that day, see them there on the left? At the time I stashed many of these smaller projects away for the winter so I would have things that were easy to work on inside the house. 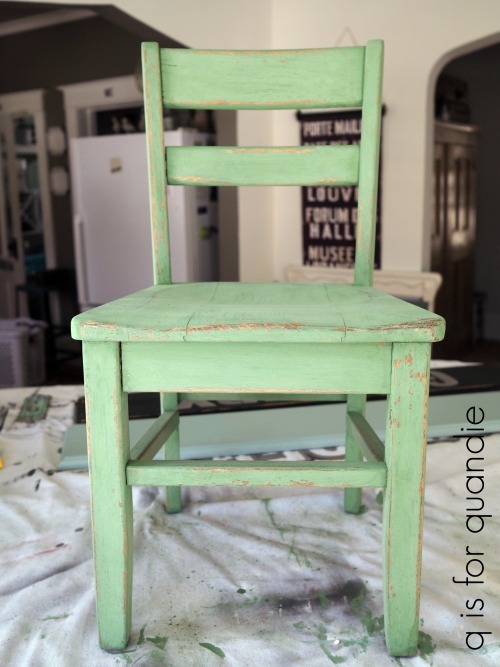 I painted the first little chair back in November in a pretty Homestead House milk paint color called Maritime. 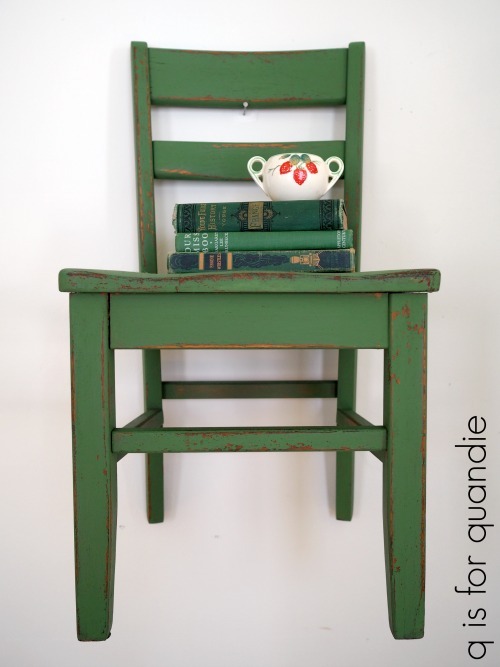 I just finished up the second one, and this time I chose Sweet Pickins’ milk paint in a color called In A Pickle. I’ve had such luck with green pieces lately so I figured I’d try it in milk paint. I’ve painted a few pieces in this color in the past and the little bit of paint powder left in the bag was just enough for this chair. I opted to just leave this chair unadorned, so no stencils or transfers. It’s perfect for providing a pop of vibrant color. The milk paint has been top coated with hemp oil, which really brings out that rich color. Here is how it looked before the hemp oil was added. 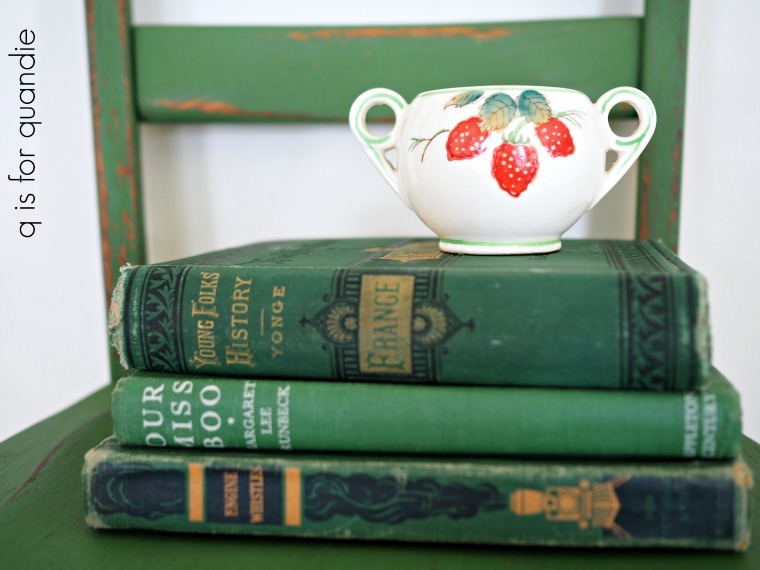 The little bowl with the strawberries on it is something I picked up at a garage sale many years ago. It’s just one of those sweet little things that I couldn’t resist. I’m sure at one time it had a lid, but now it’s lidless. I store paper clips in it. It never fails to bring a smile to my face when I see it. I love the little lines of green around the base and handles. I’ve hung the chair on the wall for the photos, I think it would be fun to use a chair like this as an alternative to a traditional shelf, don’t you? I’m slowly but surely making my way through all of the smaller projects that I had stashed away for the winter. Luckily spring is just around the corner (shhh, don’t tell me differently, this is what I keep telling myself) and along with spring comes garage sale season! It can’t get here soon enough. Previous the boutique de vin dresser. I love that green. I keep meaning to pick some up but it goes out of my head about 10 seconds after I register that thought! I even googled shops that carry it and found one by the antique mall I sell my stuff in. Oh and that sugar bowl is really sweet. I am so glad that I’m not the only one who appreciates the older painted pieces. I know clean and simple is the new decorating mantra, but I still want the ‘cozy’ style of decorating with dishes that are sweet sometimes. I have a terrible weakness for sweet vintage china, even though it’s no longer ‘in style’ Whenever I see a piece at a garage sale with a price tag under $1 I have a hard time passing it by. 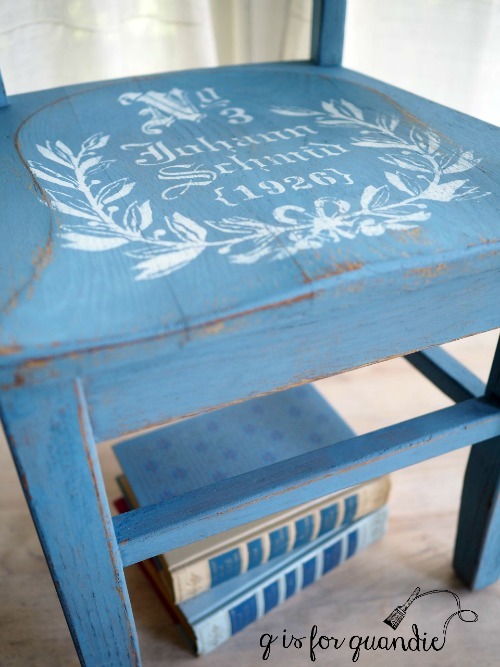 Pretty chair! Hemp oil darkens color; does it protect paint from chipping more? What other finishes do you use over milk paint? I’ve heard people say otherwise, but in my opinion hemp oil does not protect the paint from chipping more. Especially if the piece is going to be handled a lot, or if it will be in a humid environment (bathroom, kitchen, porch). 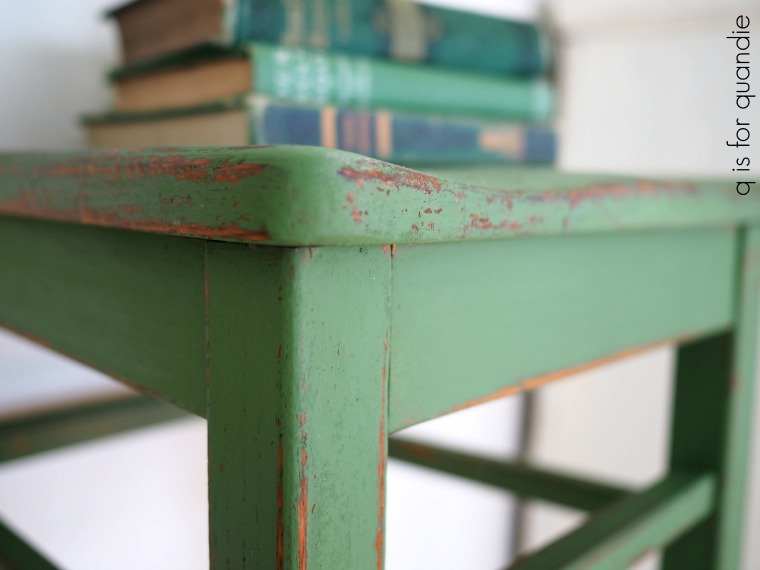 Of all the potential topcoats for milk paint, hemp oil provides the least amount of protection. So you may not want to use it on a table top for instance. But that’s all a matter of preference. I have many hemp oiled milk paint pieces in my own home and the way they continue to wear over time is what I love about them. I also frequently wax my milk paint pieces. Wax provides a little more protection than hemp oil, and it doesn’t darken up the color as much. Lately I’ve also been using The Real Milk Paint Co’s Dead Flat finishing cream over milk paint (and this product will do more to prevent continued chipping). It’s super easy to apply with a brush, soap and water clean up, doesn’t drip because it’s very thick, it won’t change the color of your milk paint by much and it provides more protection than hemp oil or wax. However, it’s not recommended for use over black or other really dark colors because it may streak. I used the Low Sheen version of the finishing cream on the nightstands in my bedroom. I felt like they needed a little extra protection since we sometimes leave a water glass on them at night. Follow that link to read more about the finishing cream. 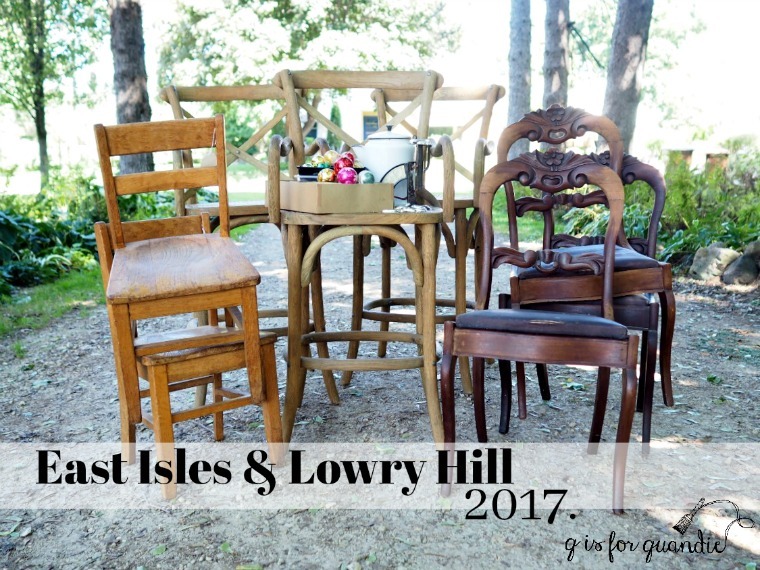 Check out this link for a post I wrote about whether or not milk paint continues to chip over time. Thank you so much for this information. I really enjoy reading your blog; I love your work. You’re welcome Linda, and thank you! The chairs are sweet and great idea about hanging on the wall. I have a small chair that I’m now going to do that with. I also love your old books. I have a weakness for old books with beautiful bindings. I recently saw an issue of Country Living (I think) where they hung several kid sized vintage chairs on the wall above a credenza and then they had globes on them. Very cool. I’m glad you’re going to put that idea to use! I know you do a lot of labor, as in work, on your pieces of Art and I find them elegant and delicious. Cheers! What I really like about the green lines on the bowl is that they aren’t rigidly perfect, they are more relaxed and that blends well with the worn chair. Darling chair of course it took the paint color to bring it back. Hope that makes sense heavily medicated due to flu. I am so looking forward to spring too! I am hoping the flu season goes far away. Bummer Victoria, I hope you feel better soon! Hi…I sure hope you are right about spring. Cute chairs . Betty in Ontario were it is now snowing up a storm right now. Those are the most adorable little emoji’s! 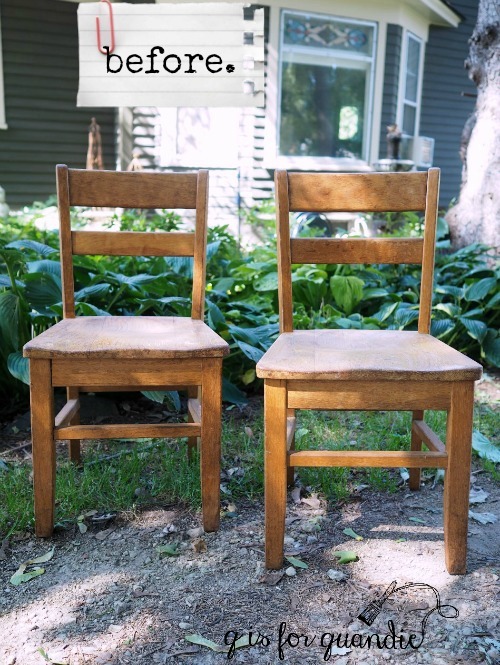 These little chairs have proven to be extremely popular and a quick sell for me. Of course, I price them to sell too (at $28) so that may help. But they are fun to work on, and a great way to try out a new paint color. 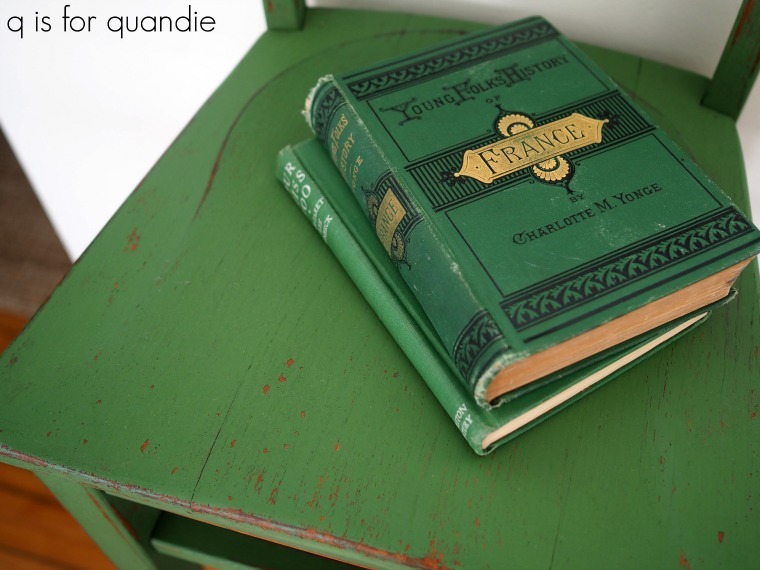 I love sturdy vintage children’s chairs and the green one is spot on. It’s amazing the difference in the color that the hemp oil makes. I also love vintage books and you always have the cutest. Great props! Thanks for sharing. Stay warm. I was really wishing for one snow here in Texas but it looks like it’s not going to happen. Maybe we should do a house swap for a week or so. Yes, a house swap right about now sounds pretty good 😉 We got a little over a foot of snow over the last couple of weeks, so we have more than enough to share! OMG, what a brilliant idea. 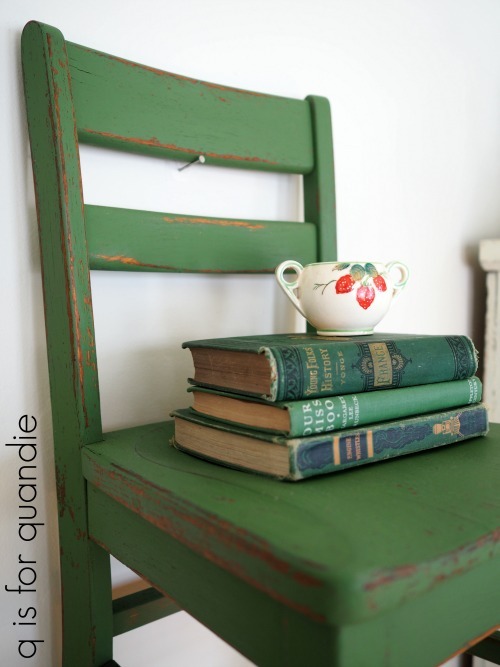 I have a very small chair exactly like this, thanks to you I will paint it green, age it, and hand it on the wall to. Thanks for the tip/idea.